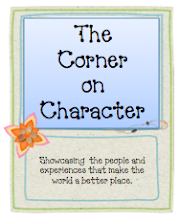 Barbara Gruener writes an awesome blog, The Corner on Character, and she contacted me asking if I would write a guest post. Needless to say, I was very honored and jumped at the chance to do so. Barbara's blog is wonderful. She has so many examples and posts about ways to build character in children. To be honest, right after I said I would write a guest post, I started to panic. I mean, what was I going to write? I started to think about what character was and what it meant to me. To me, it means to make a difference. So, after what seemed like an eternity, I finally figured out what to write about. You can see my guest post here or read it below. I was in my early years of my career when I first met Jennifer, a spunky, good spirited, and fun loving middle schooler. Jennifer had moved into the area to live with her Aunt when her mom was no longer able to care for her. Jen was one of those kids that could light up a room when she entered. She was smart, funny, loving, and just a great kid. Jen had a pretty terrible past; one that no little girl should ever have to endure. For what she had been through, Jennifer was well put together and always smiling. She kept her secrets well hidden and locked away in the closet. They were for only those that really knew her well to know. Jennifer hung around my office a lot, and to be truthful, I loved the fact that she did. The more time we spent together, the more she shared with me about her background, her family, and the secrets she kept. Jennifer was the kid that I wanted to take home. I know she often felt alone and unloved, but really she was loved more than she could ever know. To this date, I love her as my own. As counselors it is hard not to get attached, get connected, have feelings for others. It is this compassion for others that draws us to counseling in the first place. I always knew I wanted to help others, little did I know, that these students who we want to help so much are the ones that actually help us the most. I learned more from Jen, than she did from me. Of this I am sure. Jennifer truly taught me what it means to make a difference. Unconditional love is not to be taken for granted. It does not mean we can treat others badly and that will mean that they will still love us. It means that we do not put conditions on our love. And love means respect. Making a difference means giving to someone those extra five minutes of your time. It’s a quick check in of “How’s it going?” It’s “tell me about your day” and “what homework do you have tonight?” It means giving someone the respect you want others to give to you. It means unconditional. Jennifer also taught me that through difficult situations, leaders can emerge. We read about this in history books, but Jen was a real life example. Although she did not feel strong or brave, she was beyond a doubt the bravest person I ever knew. I learned through Jennifer that kindness is the most important bond that can bring people together. It is kindness that hides the darkness, tames the fear, and creates greatness. It’s more than 15 years later, and I still keep in contact with Jennifer. She goes by Jenny know, and has grown into a beautiful women, a wonderful mom, and a fantastic teacher. She has told me she appreciated all the time we spent together and how I never gave up on her. I am humbled by her words and grateful for the love she has for me in return. I have founded several school counselor groups on Facebook and I asked the questioned, “What do you love most about being a School Counselor?” Most of the responses included helping students and making a difference in the lives of others. I don’t discredit those answers, but for me, what I love the most is when students make a difference in me. the experience as much as you put into it. It will be well worth it I promise. I was...and still am...only as brave as those around me. I'm sure we could debate the idea of "who taught who." I think the biggest message is that sometimes in life---it takes ONE person to be the soul who reconnects someone else to the universe. That soul was you--and I am reconnected! I hope you continue to inspire others to be "the one." I love you Jenny. And yes, I have tears in my eyes. Be sure to go out there and teach your kids to be brave. Just like you.